One of the best way to relaxing your body is by lay-down on the beach. A warmest beach with its soft sand is a perfect one. Especially when the beach has a complete facilities to support your activities. And here we are with the info about the beach facilities in Bali. See you on the beach!! A broad range of accommodation is represented here  from small budget hotels to international resorts. The beach is perfect for swimming and sunbathing, and there is a host of water sports activities available. An ideal place for families. This beachfront hotel is located at the southern end of Sanur. There are standard, superior and deluxe rooms as well as bungalows available, all air-conditioned with mini-bar, IDD phones, and private terrace or balcony. The Santrian Club has its own magnificent pool and the rooms are amongst the very best in Sanur. This lovely resort features 2 further swimming pools, a choice of 2 restaurants and 2 bars and is a very popular place with many regular guests. Ideally situated 20 minutes by car or coach from Bali's Ngurah Rai International Airport and 10 minutes from the city of Denpasar. Located on prime Sanur beach. Set amongst 36 acres of beautifully landscaped gardens, with a 500-metre long white sandy beach King and twin-bedded rooms. Each classic Balinese guestroom has been lovingly restored and has its own balcony with restful views across beautifully landscaped gardens or the balmy ocean. Decorated to the highest standards with traditional Indonesian fabrics and natural wood finishes with vanity and luxurious bath, featuring colorful, hand-painted ceramic tiles and a marble finish . 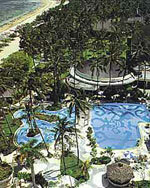 This first class beachfront hotel is the largest resort in Sanur. Accommodation can be in the 10-storey tower block, the garden wing or in garden cottages. Facilities include a large variety of restaurants and bars, a shopping arcade, 4 swimming pools, tennis courts, 10-pin bowling alley, mini golf, various water sports and a 9-hole golf course. The atmosphere is easy-going, informal and full of good fun. A unique holiday centre with white sand beaches and excellent surfing conditions. This first class hotel is set in lush gardens surrounded by palm trees. The unusually large rooms are just perfect for families. This property features 3 restaurants, coffee shop, bars, 2 swimming pools, tennis courts and a complimentary kids club. An excellent resort for active families than can accommodate up to 3 children. There is a shuttle service to Kuta. Just 100 metres from the beach in the quieter Tuban area and surrounded by tropical gardens, this hotel offers comfortable standard accommodation. All rooms are simply furnished and have air-conditioning, television, fridge with mini-bar and IDD telephone. The swimming pool features a swim-up pool bar and the restaurant is open 24 hours. A shuttle bus is provided 3 times a day to down town Kuta.